19th of April at Poznan University of Technology the Letter of Intent between Poznan University of Technology and the Western Chamber of Industry and Commerce in Gorzów Wlkp. was signed. Both Institutions expressed their will to cooperate in the field of projects developed by the Chamber under the Regional Operational Programme Lubuskie 2020, but also within the activities implemented by the Technical Knowledge Accelerator®. These activities relate to the access to knowledge, improvement of skills and competences and their adaptation to the needs of the labor market, prevention of social exclusion. From the Poznan University of Technology The Letter of Intent was signed by the Rector of Poznan University of Technology Full Professor Thomasz Łodygowski, Eng. PhD. and by Jerzy Korolewicz – the President of the Western Chamber of Industry – Commerce. Maciej Szafrański, Eng. PhD. 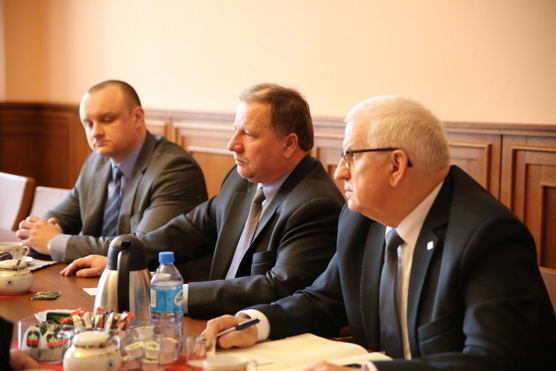 (PUT) as well as Stanisław Owczarek and Dariusz Przybyłek (WCIC) also participated in the meeting.